There are many Beatles tributes. But there’s only one show that celebrates the genius of Paul McCartney at the height of his career in the mid-1970s. And this is it! The McCartney Years On Tour ! Praised by Beatles promoter Sid Bernstein – the man who brought the original Beatles to North America – as ‘the best on the scene today’, The McCartney Years is a note-for-note faithful recreation of a mid-1970s Paul McCartney concert. Led by perfectionist Yuri Pool as Sir Paul, the band has a commitment to 100% live and accurate reproductions of McCartney’s concert experience. The show is period-true, technically stunning and sonically explosive. Every note is live and played true to its original arrangement. It has set the standard for all who might follow in this significant body of work. And, it’s a blast to watch and listen to! Whether he plays an original Beatles-era Hofner bass or sports the same wardrobe from the “Wings over America” mid-70s tour, Yuri is true to Sir Paul in his musicianship, vocal stylings and presentation. And the band doesn’t miss a beat delivering a texture that will transport you back to the first time you heard these great songs on vinyl. TMY players include David Usselman (guitars and bass); Braden DeCooman (guitars); Hubert Orlowski (keyboards and synth); Laura Gagnon (percussion and keyboards; Dean McKey (drums) and of course Yuri on bass, vocals, piano and guitar. 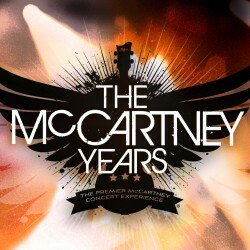 Experience three decades of ‘The Beatles’ and ‘Wings’ live – with the world’s premier McCartney concert experience. Rewind into the 60s and 70s to dance, sing and relive your passion for McCartney with a band that has opened for Mariah Carey, performs sold-out shows across Canada, the U.S.A. and Europe and been featured on CNN.